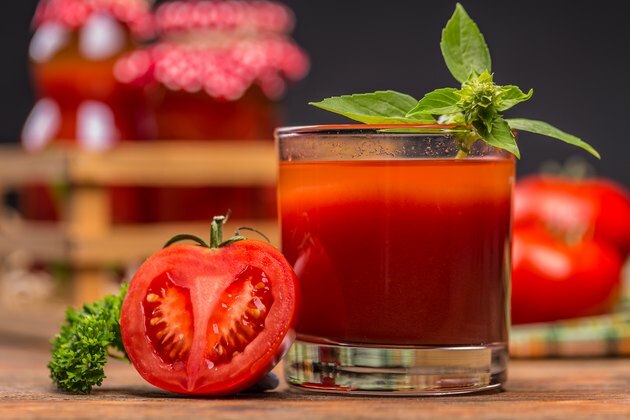 Drinking tomato juice helps you get all the advantages that tomatoes have to offer, and more — the processing of tomatoes to make juice releases compounds you don't absorb as well from raw tomatoes. The tomato, actually a fruit and not a vegetable, is a potent source of vitamins and minerals. Beyond its basic nutrition, tomato juice can help your immune system prevent and fight a number of diseases. To obtain all the benefits tomato juice has to offer, your drink should be natural and freshly made. If you buy store-bought tomato juice, check the label to make sure it doesn't contain added salt, sugar and preservatives. With 1 gram of fiber, this tasty drink supplies 4 percent of your daily value. The sodium content is only 24 milligrams per cup, representing 1 percent DV, according to USDA National Nutrient Database. But be wary of the added salt content in some prepared juices, such as V8, and choose natural products with low or reduced sodium. One glass of tomato juice delivers 74 percent daily value for vitamin C and 22 percent for vitamin A, both vitamins that help your eyesight. Other key vitamins include folate, vitamins E and K and B vitamins — thiamine, niacin, pantothenic acid, riboflavin and B-6. Tomato juice provides 16 percent DV for potassium, needed to keep your heart beating properly. Other minerals include manganese, phosphorus, copper, iron and magnesium. As if this powerhouse of nutrition isn’t enough, the real star of tomato juice is lycopene. Tomatoes are one of the most concentrated sources of lycopene, an antioxidant that belongs to the family of carotenoids, which includes beta-carotene and lutein. This phytochemical gives tomatoes their bright red color. Lycopene may help reduce the risk of cardiovascular disease, prevent cataracts, provide anti-inflammatory effect for weight management and protect against various types of cancers. Drugs.com says dosage guidelines for lycopene supplements range from 10 to 30 milligrams taken twice daily. One cup of tomato juice provides approximately 23 milligrams of lycopene, according to Encyclopedia of Food Sciences and Nutrition. Encyclopedia of Food Sciences and Nutrition lists tomatoes and processed tomato products, such as tomato juice, as the most abundant sources of lycopene. Your body absorbs lycopene more effectively from tomato juice than from raw tomatoes, according to the American Institute for Cancer Research. Heat from cooking tomatoes breaks down cell walls to allow for the release of lycopene making it more bioavailable to your body which helps increase antioxidant activity. Important nutrients in tomato juice that support heart health include potassium and vitamins C and E. Potassium is essential for maintaining blood pressure by reducing excess sodium in your body. Lycopene helps strengthen your arteries and reduces cholesterol levels in your blood. Researchers conducted a systematic review of 28 publications to assess the association of lycopene in tomatoes and the risk of cardiovascular disease. Results, published in Critical Reviews of Food Science and Nutrition in 2017, showed that the highest consumption of tomato concentrate was associated with 26 percent reduced risk of stroke, 14 percent reduction in heart disease and 37 percent lower risk of mortality. Thanks once again to lycopene in tomato juice, drinking a glass each day can help prevent many forms of cancer. Reports indicate that lycopene has an anti-inflammatory and anti-cancer effect that relates to a decreased risk of breast, prostate and lung cancers. Proof is reported in a 2013 issue of the journal Evidence Based Complementary and Alternative Medicine. Clinical trials and in vitro studies showed that lycopene can stop cell growth and kill cancer cells without interfering with normal cells. Findings also revealed that lycopene inhibits tumor growth in the liver, lung, prostate, breast and colon, and protects against prostate cancer. Similar findings that confirm the effectiveness of lycopene in tomato juice result from a study published in 2017 in the journal Nutrition Research and Practice that examined the role of lycopene on inflammation. The conclusion suggested that colorectal cancer cells were inhibited by lycopene acting as an anti-inflammatory. Read more: What Is an Allergic Reaction to Tomatoes? Another benefit of tomato juice as an inflammation-fighting food involves weight management. Medical treatments for weight loss are focusing on the need to reduce chronic inflammation, which may be an underlying factor in weight management, according to research by the European Molecular Biology Organization. Inflammation interferes with the body's response to the hormone leptin, which signals the brain to stop eating when you're full. Resistance to leptin is now thought to be a major driver of weight gain in humans. By reducing inflammation, leptin can help with appetite control and weight loss. Researchers at the Tehran University of Medical Sciences analyzed how the consumption of tomato juice may help reduce inflammation in people who are overweight. They observed that an overweight group given 330 milliliters per day of tomato juice had less inflammation than those given water. The conclusion was that tomato juice reduces inflammation in overweight females, as published in British Journal of Nutrition in 2013. Tomato juice may also help reduce the risk of developing other inflammatory conditions, such as cardiovascular disease and diabetes. PubMed.gov: Lycopene and Tomato and Risk of Cardiovascular Diseases: A Systematic Review and Meta-Analysis of Epidemiological Evidence. PubMed.gov: Multiple Molecular and Cellular Mechanisms of Action of Lycopene in Cancer Inhibition.